Peter Bergen - Kirkus Review starred for "The Longest War"
A revelatory, pull-no-punches history of the War on Terror, from before 9/11 to the present day. 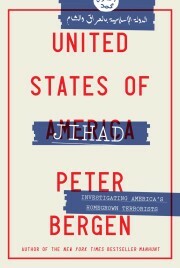 CNN national security analyst and journalist Bergen (The Osama bin Laden I Know: An Oral History of al Qaeda’s Leader, 2006, etc.) takes a critical look at all phases of the conflict between the West and al-Qaeda. Drawing on an impressive range of both Western and Islamic sources, the author examines the historical and philosophical underpinnings of the jihadist movement, most importantly as exemplified by Osama bin Laden. Bin Laden’s charismatic appeal arises in part from conscious emulation of the prophet Muhammad, writes Bergen, even as early as his joining the fight to expel the Soviets from Afghanistan. In particular, his personal asceticism, maintained in spite of his great wealth, gives him credibility with the disaffected of the Islamic world and makes it easy for him to recruit candidates for suicide missions. But Bergen argues that bin Laden’s greatest triumph was also the ruination of al-Qaeda, making him the target of the most relentless manhunt of our time and forcing his followers to the margins of civilized society. At the same time, the Bush administration’s response to 9/11 was deeply flawed; the failure to close the trap on bin Laden at Tora Bora left him and his organization free to continue the fight against the West. Then, the Iraq war, against a country that had no part in 9/11, cost the United States an unprecedented level of international support, especially as the Bush administration abandoned the Geneva Convention in its treatment of prisoners. Bergen looks at the lessons learned on both sides of the war, notably the U.S. military’s rediscovery of one of the lessons of Vietnam: Small units working closely with the indigenous population can achieve what large concentrations of conventional force cannot. The author concludes that, simply by surviving so long, bin Laden has created a movement likely to carry on his brand of anti-Americanism for the foreseeable future. One of the deepest and most disturbing investigations of one of the defining issues of our era.